Nonetheless, it has never been a totally acceptable practice, even in ancient times. In the old testament of the bible, the book of Leviticus 19:28 warned against it. The past and present society has always viewed tattooed people as deviants and even outcasts, and they have been less accepted in the society, especially in the conservative Africa. Tattooing involves multiple intra-dermal injections into the skin by small machines having one or more needles connected to the tubes containing the dyes, with the tattooist guiding the machine over the skin and controlling its speed. The procedure involves a variable amount of pain and bleeding, and it can take several hours, depending on the type and size of the tattoo. The site of application usually takes up to 7 or 10 days to heal. Intra-dermal tattoos are permanent and removal involves surgery, dermabrasion or possibly searing, most accompanied with pain. Apart from the social stigma and alienation which could result from tattooing, the health risks can be devastating, with the two most significant ones being those of allergic responses to the pigments and exposure to blood-borne pathogens. The compounds used as pigments range from metallic oxides to synthetic organic dyes. Cases of hypersensitivity reactions to pigments have been reported but the incidence of these reactions is low. However, the prevalence of the second risk is actually high, especially in occasions where an amateur carried out the procedure or places where cheap tattooing are possible. Tattooing involves injection into the skin under the skin; invariably, there is a risk of bacterial, fungal and/or viral infection, especially where there are poor sanitary controls by the tattooist before and during the procedure, and by the tattooed individual after the procedure. There have been cases of Hepatitis B transmission as well as incidents of transmission of HIV and Hepatitis C.
Although social acceptance and individual stigmatization is the frequently discussed issue, emphasis should be and is shifting toward the proper and hygienic conduct of the procedure. 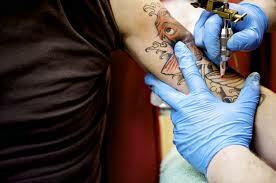 In the developed countries, states and localities have rules and regulation guiding tattooing. Tattoo parlors have been fingered as origin of outbreaks of infectious diseases, and most parlors are mandated to practice good sanitary measures to reduce or eliminate spreading of such diseases. Most tattooing parlors, even in developing countries, have been shifting focus to cleanliness and sterilization of equipment used, and though regulation is still low in developing countries, the fear of fatal infectious diseases is making people more cautious. The Alliance for Professional Tattooists (APT), a non-profit organization in the United States, in association with the Food and Drug Administration (FDA), has developed a set of infection control guidelines for tattooist. While there would always be debates about the negativity of tattoos and whether tattooed persons are society deviants or not, it is a fact that tattoos have come to stay, just like they have been staying since the times of the Pharaohs and the Iceman. Thus, the saying that whatever is worth doing at all is worth doing very well should be applied to the issue of tattoo. You are so cool! I really do not believe Ia? ?ve read through anything like this just before. So great to discover any person with some unique thoughts on this subject matter. Many thanks for starting up this up.